Adding Up the Wasted Hours is a record soaked in sunlight and new beginnings, perfect for a morning drive when you’ve got the whole world in front of you. The album benefits greatly from the band’s newfound songwriting freedom, and while the first three tracks adhere to mostly short song lengths, the conclusion of “Fire-Breather” comes to usher in a new era for The Lonely Forest, where they can take as much time as they want to develop their ideas, small or large. “Pull the Pin and Forget” is a strong, slow-burning opener that incorporates a lot of ambience and even some fast electronic synth lines, which are a nice new addition to the band’s sound, but sometimes feel a bit too intrusive. The synth continues to stick out at certain points throughout the album, like in the intro to “Warm/Happy” (almost sounding like a bad space movie score), but the band finds a way to quickly redeem themselves by the second verse, building a very interesting contrast between the blatant artificiality of the keys and the vintage, warm 60s bass lines. The welcomed lack of a meddling major label is never more apparent than in the one-two punch of “Left Hand Man” and “Neon Never Changes,” with the former fleshing out a wonderful extended instrumental bridge, and the latter functioning as a complete sonic overhaul of the band’s previously established sound. At first, “Neon Never Changes” feels incorrect, as it certainly is the black sheep of the record with its 80s-inspired soundscape (something you could almost imagine hearing on the hometown oldies radio station), but despite its incongruity, it becomes one of the more memorable tracks after repeated listens. The Lonely Forest continues to revel in their independence during 43-second offering, “Lavender Dress,” and behemoth album closer, “The Stars, Like Dust,” which achieves a level of success that never would have been possible if condensed into anything less than eight minutes. The synth is actually used quite well here, as it serves as the bridge between the two halves of the song, holding the track tightly together as it heads for the finale. As much as The Lonely Forest wants me to believe they’re a lighthearted, fun band, they always find a way to sneak in some seriousness into their often very upbeat songs. “Lovric’s” is such a happy sounding track until the dark final line, “I’m so happy going nowhere with you,” paired with a sudden minor key shift. Being the only minor chord in the entire song, this concluding note becomes intriguingly acrimonious and serves to question whether all that came before it really was as lighthearted as it seemed. The lyrics continue to paint this puzzling picture, ranging from the simple (“Every time our eyes met / I forgot why I came / It was the last time I said your name”), to depressing (“I have overturned rocks searching for life below / And now I shall put them all back”) to the blatantly existential (“Everything is meaningless / Because all the stars, they are like dust”). 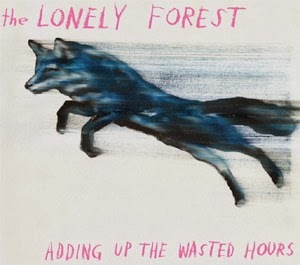 The final lines of the album, “Oh what a beautiful way to waste our time,” seem to present the clearest notion of who The Lonely Forest actually is at this point. They’ve been through the major label game, they gave everything to make it work, until they were spat out on the other side. They abandoned comfort, homes and strained their personal relationships to the breaking point, only to get dismissed by the big guys in charge. Of course, they still love music deeply, but they love their families just as much, and with rejection comes clarity. I think The Lonely Forest knows now more than ever before that there is no need for them to mold themselves into something they aren’t at the sacrifice of what’s important to them. They will play music their way: diverse, amorphous and delightfully inconsistent, and what could be better than that? Adding Up the Wasted Hours finds the band free and in love once again, and there are few better ways to waste your time this year than by wasting it with The Lonely Forest.